Coming out of WWII, America's Air Force was the undisputed champ of the skies. That all changed during the Korean War when Soviet forces unveiled the MiG-15, a sprightly swept-wing interceptor that would go on to spark decades of dogfights. 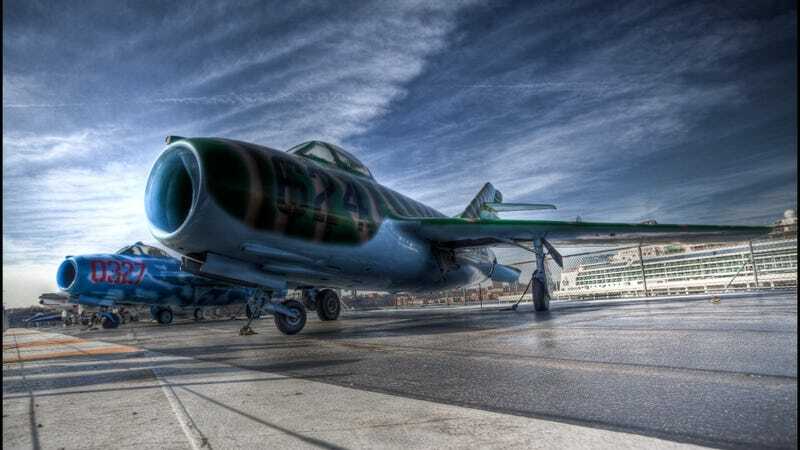 The very first turbo jet fighter to come out of the Soviet Union was the MiG-9. It was developed by Artem Mikoyan and Mikhail Gurevich (MiG, get it?) and first flew in 1946. However, it's engine, being reverse-engineered from a German BMW 003, couldn't produce much more than 2,500 pounds of thrust. The under-powered engine, along with flimsy straight wings, made the MiG-9 really unstable at speed. So, Mikoyan and Gurevich went back to the drawing board. They scrapped the straight wing design in favor of ones that swept back at a 35-degree angle, added swept tail wings, a pressurized cockpit and ejection seat (both firsts for Soviet aircraft), and rerouted the tailpipe to the very end of the plane. These modifications all helped to better stabilize the plane, now dubbed the I-310, but did nothing to remedy the sickly engine. Luckily, the British Labor government at the time was more than happy to sell the Soviets a bit of better technology. Mikoyan and Gurevich had been impressed with the Biritish-made Rolles-Royce "Nene" turbojet engine for some time, however, being on opposite sides of the Iron Curtain made getting a hold of the technology very unlikely. Stalin himself is quoted as saying, "What fool will sell us his secrets?" Apparently that fool was Minister of Trade, Sir Stafford Cripps. With the blessing of the Labor party, the Ministry of Trade licensed the Soviets schematics of the Nene. These plans were immediately reverse-engineered to create a nearly-identical motor with 4,800 pounds of thrust, dubbed the RD-45, which was then installed in the I-310 to create the MiG-15. With the engine upgrade, the MiG-15 became an agile single-seat interceptor measuring 33 feet long with a 33 foot wingspan. It was, after all, designed to hunt the B-29 Super Fortress and B-52 Bomber, however, despite the turbojet engine, the MiG-15 was unable to reach supersonic flight. It could dive at supersonic speeds, sure, but the plane's "all-flying tail" caused massive instability as the aircraft approached Mach 1. In fact, the plane was designed to automatically deploy air-brakes in the event that the craft reached Mach .92. In addition, the first run production models had such great variances in their assembly, that they tended to roll lazily left or right while in flight. Ground crews had to install and calibrate aerodynamic trimmers to correct the faults. These issues were corrected about a year after the MiG-15's debut in 1949 with the creation of the MiG-15bis. Since the MiG-15 was built as a bomber hunter, it did not carry air-to-air missiles. Instead, the aircraft was outfitted with a pair of 23mm and one 37mm cannon. They packed a punch, but had a limited range, which made them great for taking down huge aircraft like the B-29 but not against its arch-rival, the F-86 Sabre. The MiG-15 did have the advantage of a higher operating ceiling than the F-86 which allowed Soviet pilots to outmaneuver their opponents. Despite the MiG-15's supersonic shortcomings, it operated extensively during the Korean War against UN forces, typically to great success. It's swept-wing design proved to be a major improvement and allowed the Soviets to dominate the UN's straight-wing craft during daylight hours.